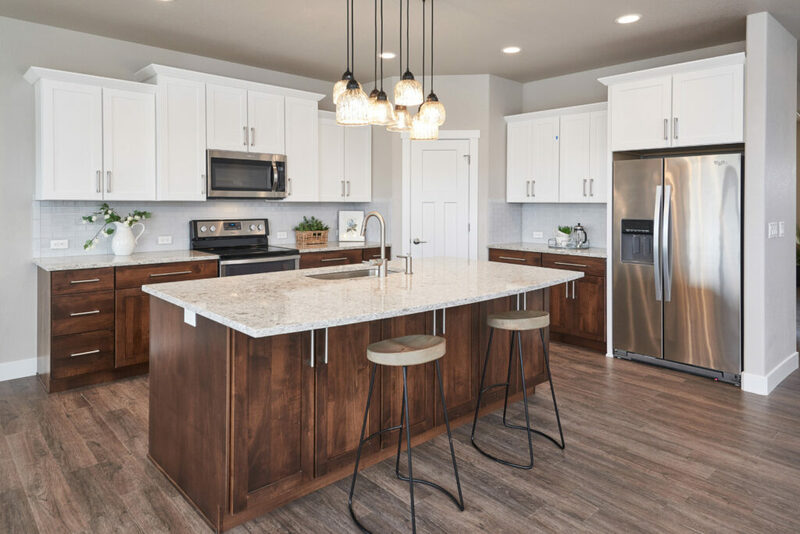 Homes By Guardian has several floor plans to choose from, whether it be a ranch-style or 2-story, a townhouse or single-family, a basic look or upgraded features. We’ve got it all! However, if a completely custom look is what you’re after, we can do that too! 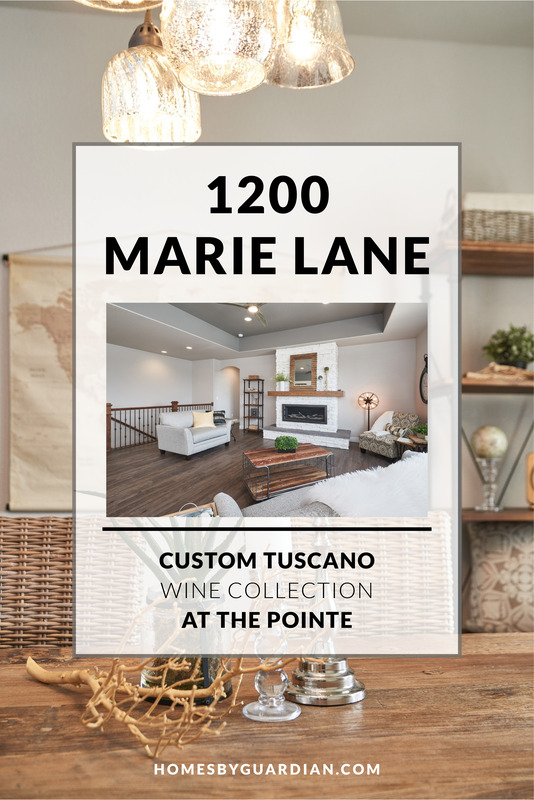 This stunning custom Tuscano home is currently featured in the Parade of Homes and it’s finishes are to-die-for! 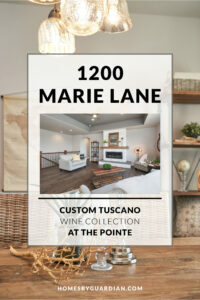 Our standard Tuscano plan is great and one of our best sellers, but this home goes above and beyond to create an entirely unique look. They say the kitchen is the heart of the home and this gorgeous kitchen might just make your heart skip a beat. You’ll immediately notice the two-toned kitchen cabinets that give this space some visual interest. While modern, all-white kitchen cabinets seem to be a “thing” lately, this design flourish adds color diversity to the kitchen, and helps to emphasize the strengths of the space. Those cabinets, along with the high-end quartz countertops, really complete the kitchen and give it a unique look. The bright pendant above the bar, also brightens it and and provides a unique look. And notice the custom walk-in pantry in the corner, who doesn’t love one of those? 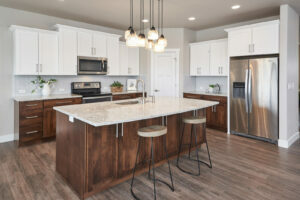 The Tuscano floor plan is great, as the kitchen and eating area flow right into the living room. Here, in this custom home, you will find an incredible floor-to-ceiling fireplace with stone surround and driftwood accents. The added trey ceiling really opens up this space and invites you in. All of the colors in this home truly make you feel at home. They are the perfect combination of modern and traditional with the cool greys and whites, but the warm and comforting dark stained wood accents. Additionally, what might look like hardwood floors flowing throughout the kitchen, dining area, and great room, is actually Luxury Vinyl Tile. This modern design trend gives your home a luxurious look, with the added resilient surface. The master suite is nothing less than perfect. The bedroom is spacious with another trey ceiling and complete with a sleek, modern ceiling fan. An all-white, sliding barn door leads into the master bathroom. Here you will find a fully upgraded five piece master bath, featuring a fabulous, freestanding vessel tub and custom tile shower. 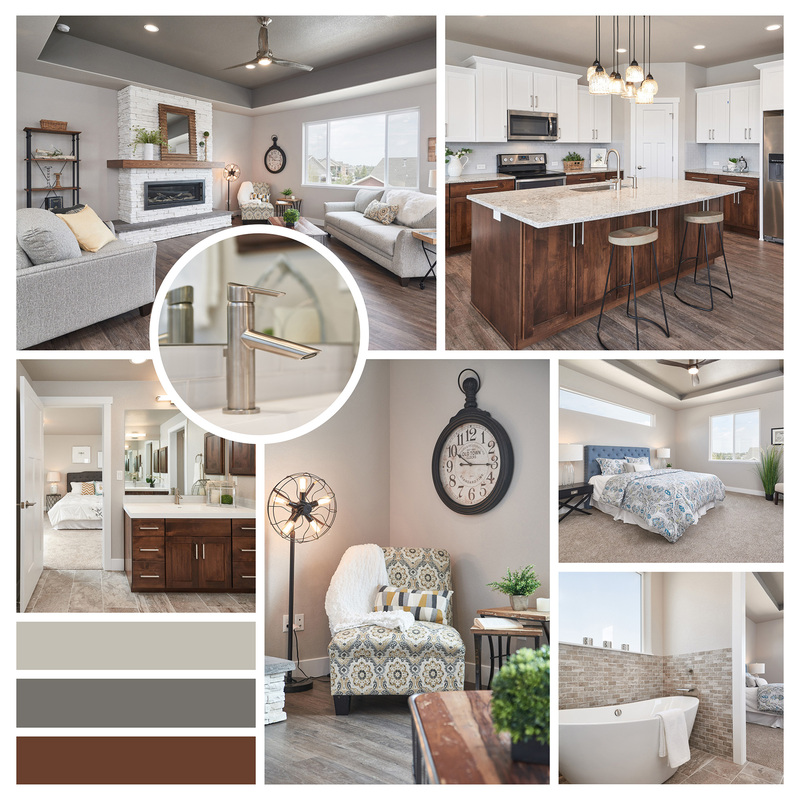 And don’t forget that this Tuscano floor plan boasts a large master walk-in closet that connects to the laundry room. Talk about making laundry day a breeze! Within the laundry room/mudroom you will find an incredibly finished drop-zone with built in cubbies. This is perfect to keep your family’s clutter organized, day-to-day. We could talk about this homes features for days. There is an entire walk-out basement that we haven’t even gotten to yet! But really we just want you to come see this home for yourself. 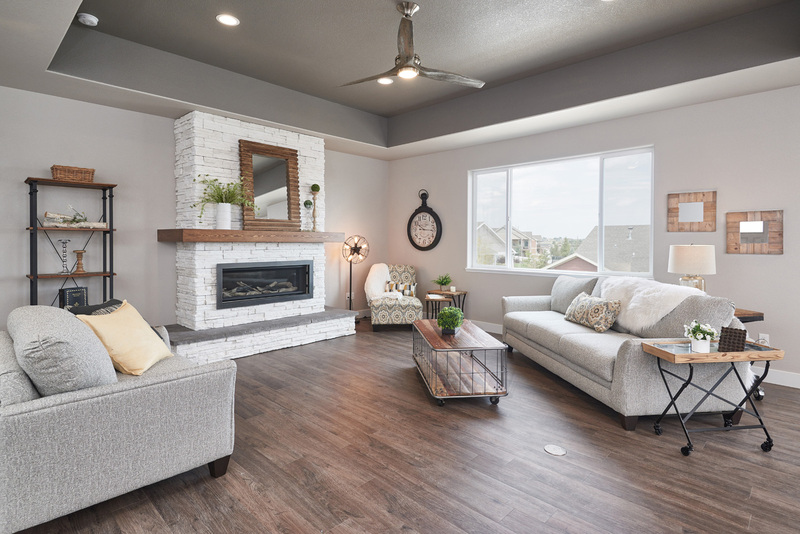 Like we mentioned earlier, this home is featured in the Parade of Homes and will be open this upcoming Saturday (August 19) from 11am – 5pm and Sunday (August 20) from 11am – 4pm. This weekend will be your last chance to see this stunner, as it is already sold! However, we’ve got another Tuscano breaking ground and there is plenty of time to make it your own! We hope to see you this weekend! And as always, if you have any questions, please don’t hesitate to contact our sales team at The Pointe.